My rating: 8/10. Fossil chronograph watch. Quartz powered timepiece. 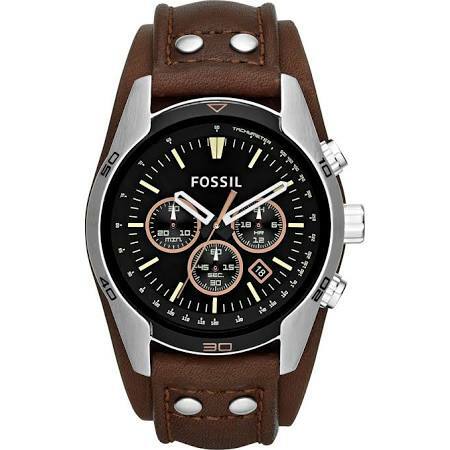 Hello, today I’m doing a Fossil CH2891 review.This is another affordable chronograph watch this time featuring a nice wide cuff style leather strap that gives it a sturdy fit. It runs on a quartz movement and comes packed in a Fossil collector illustrated tin box. I hope you enjoy this Fossil CH2891 review below. 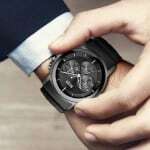 This Fossil watch has a smart chronograph style display with 3 chronograph sub dials and a small date display on show. The hands and hour markers both feature a coating of lume for easier reading in dim lit conditions. The glass is made of a specially hardened mineral crystal. This type of glass offers a good level of scratch and knock resistance. It’s found on many watches in this price range. At the heart of the watch is a reliable and accurate quartz style movement. These are popular due to their relatively low cost and the fact they require very little maintenance. Again, these are also commonly found in many watches in this price range. The casing diameter of this Fossil watch measures approximately 44mm and has a thickness of 13mm. This is a popular larger size that’s suitable for men with medium to large wrists. 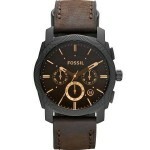 The cuff style genuine leather strap is one of the main features of this Fossil watch. It’s made of a dark brown genuine leather with dark brown stitching and features four stainless steel rivets for decoration. The strap fastens with a buckle style clasp and has a width 22mm. This watch has a 100m water resistance rating. A 100m or 10 bar rating makes this watch suitable for recreational surfing, swimming, snorkeling, sailing and water sports. 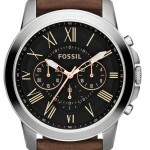 This is another great affordable timepiece from Fossil. I really like the look of this wide cuff style genuine leather strap and the dial has a nice high contrasting display with the bright white hands over the black dial. Hope you enjoyed this Fossil CH2891 review. Find more watch reviews below.